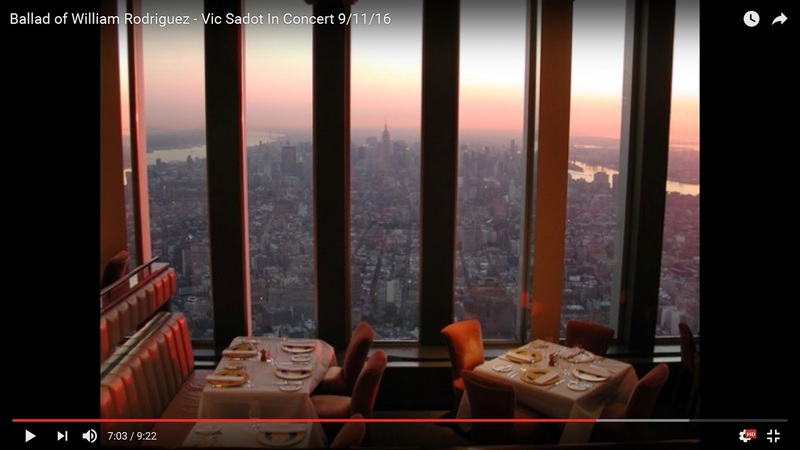 BALLAD OF WILLIAM RODRIGUEZ Video from Vic Sadot Concert 9/11/16 Released! 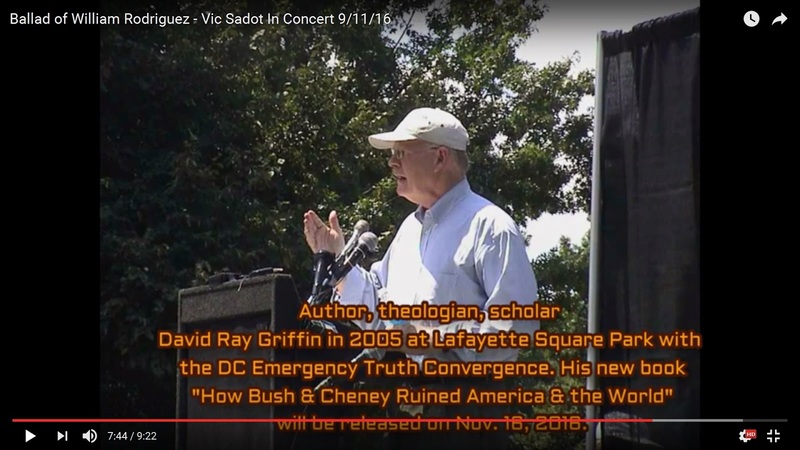 Vic Sadot sent out numerous emails to the 9/11 Truth Movement contacts that he has made since becoming active in 2005 when he attended the "DC Emergency Truth Convergence". 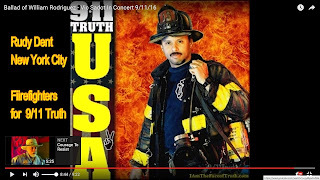 It is rare for some 9/11 Truth groups to give much prominence to an admittedly sparse number of 9/11 Truth singer-songwriters. It is normally scholars and experts in other fields. 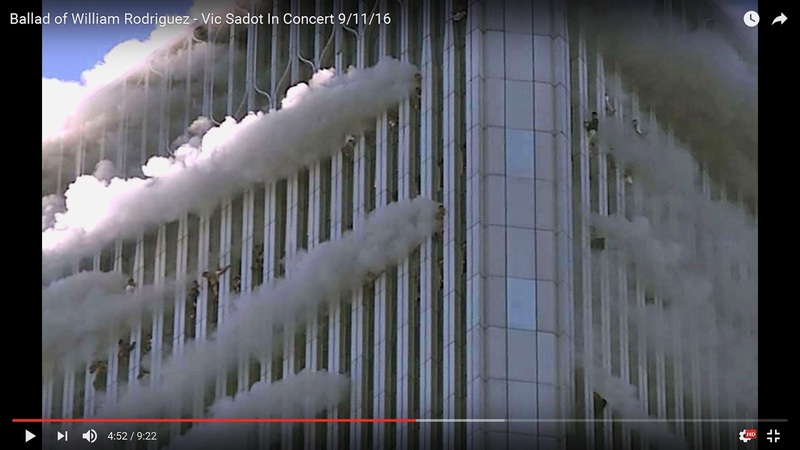 9/11 Fifteen Years Later - What Have We Learned? 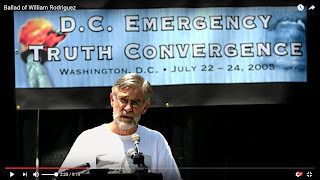 (1:42:34) Other Voices, Other Choices with Ray McGovern & Donna Marsh O’Connor at Binghampton University 9-09-16. 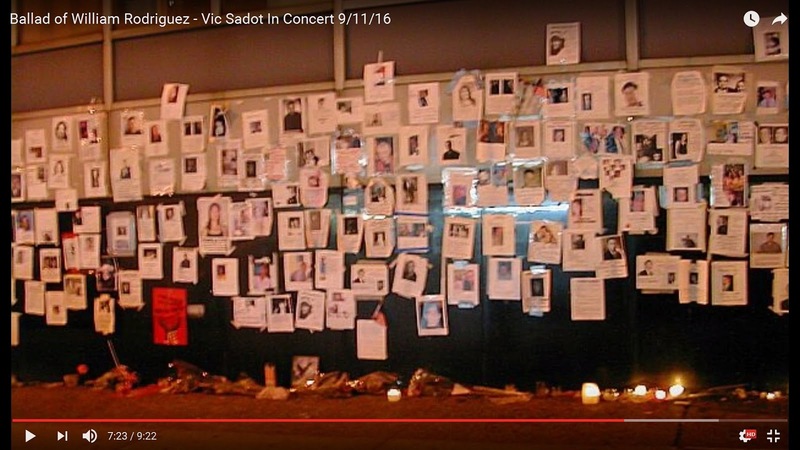 Vic Sadot statement: "Since I was not invited to sing anywhere by any 9/11 Truth groups for the 15th anniversary of 9/11, I scrambled to get a hall to do a concert and did all of the organizing with a small team endorsed by the Berkeley Fellowship of Unitarian Universalists Social Justice Committee. They Event Team is listed in the credit role at the end, including key organizer Cynthia Jean Johnson and Sound Engineer Dave Yandle who did sound and recorded the concert at a high quality level. The post audio and video production work was done by Vic Sadot himself. The new nine minute and 15 second video production released just three days after the concert rapidly reached many more hundreds of people than attended the hastily organized event in Historic Fellowship Hall in Berkeley. Opening Candle Lighting Ceremonial with Cynthia Jean Johnson and Vic Sadot on reflection of the 15th Anniversary of the event that was used to justify many wars of terror abroad and in the "homeland" including the Orwellian-named suspension of the US Constitution known as the "Patriot Act" driven by the same perpetrators use of US Army Nano Aeorosolized Anthrax Attacks on the US Congress and other Americans in crudely written letters meant to pin the blame on Muslims. 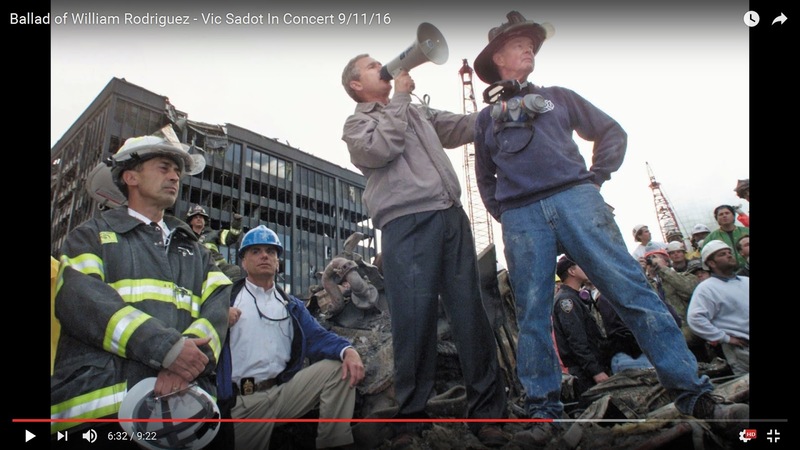 Vic Sadot statement: "Since I was not invited to sing anywhere by any 9/11 Truth groups for the 15th anniversary of 9/11, I scrambled to get a hall to do a concert and did all of the organizing with a small team endorsed by the Berkeley Fellowship of Unitarian Universalists Social Justice Committee. 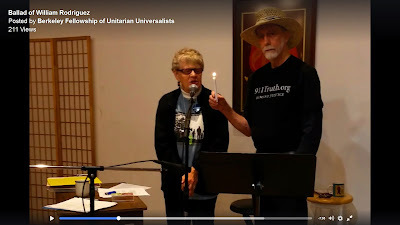 The 9/11 "Truth & Justice Love Songs" Event Team is listed in the credit role at the end, including key organizer Cynthia Jean Johnson, who did the Welcoming & the Candle Lighting Ceremony with Vic. Sound Engineer Dave Yandle did sound and came through with a quality recording of the simple solo with guitar concert. The post audio and video production work was done by Vic Sadot himself. The new nine minute and 22 second video production released just days after the concert has rapidly reached many more people than attended the hastily organized event in Historic Fellowship Hall in Berkeley. Sadot issued a statement in the description boxes for this new video, which has been posted at (1) "Truth Troubadour" YouTube Channel; (2) BFUU Facebook Videos Collection: (3) and a final-edit version posted at Vic Sadot YouTuve Channel with new text info on the people at the 2005 DC Truth Emergency Convergence event that Vic spoke about in this section of the concert. 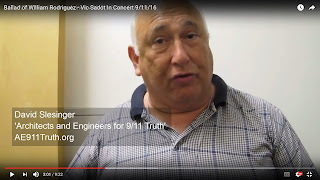 Vic is a member of Actors and Artists for 9/11 Truth, but has received no responses to proposals written to that "organization" about creating concerts or getting singer-songwriters and actors included in 9/11 Truth events. 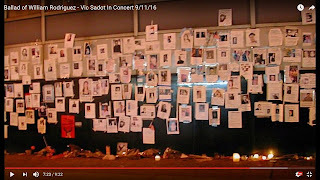 Vic is also active on Facebook with IAmTheFaceOfTruth profile photo 9/11 visibility project founded by Claudio Marty. There is a whole section at the end of this Ballad of William Rodriguez Blog that promotes Facebook users to consider joining this movement. But it is not a fad. Your commitment will to be to keep some variable but constant profile photo provided by 9/11 IAmTheFaceOfTruth and to keep that banner flying until we get 9/11 Justice! You are encouraged to change your cover photo if you are looking for regular changes in the opening look of your Facebook page. "The Ballad of William Rodriguez" (9:15) Vic Sadot YouTube Channel. Lyrics are in description box! 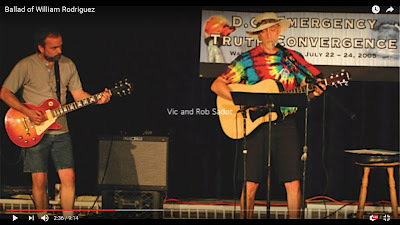 Rob Sadot on electric guitar and Vic Sadot on acoustic guitar at American University on Rob's Birthday, July 23. The pair hauled a complete sound system to the stage and was largely ignored by the scholarly gathering that the musicians drove in from Delaware to perform for. They did not seem to acknowledge a role for singer-songwriters in the movement. Click on the link to hear original full band version of Ballad of William Rodriguez with accordion, acoustic and electric guitars, bass and drums mixed nicely by our long time producer buddy Dean A. Banks. 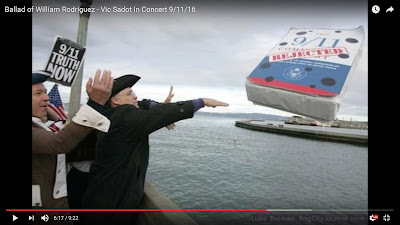 Vic Sadot: "In July 2005 I sang two brand new songs, "Mad Cowboy Disease" and "Are You A Citizen Or Are You A Slave? ", at Lafayette Square across from the White House at a rally by the DC Emergency Truth Convergence. Later my brother Rob and I did a full set of songs for the group at American University. On 9/11/11, the 10th Anniversary, I released a CD on 9/11/11 titled "9/11 Truth & Justice Songs" atCD Baby. I am "Truth Troubadour" at YouTube, Blogspot, and Twitter. It will be the title of my next CD, which I hope to have out very soon in the Autumn of 2016." Sadot issued a statement in the description boxes for this new video, which has been posted at "Truth Troubadour" YouTube Channel, BFUU Facebook Videos Collection, and a final-edit version posted at Vic Sadot YouTuve Channel with new text info on people at the 2005 DC Truth Emergency Convergence event that Vic spoke about in this section of the concert. Many people remain unaware that the first attempt to blow up the World Trade Center was in 1993. 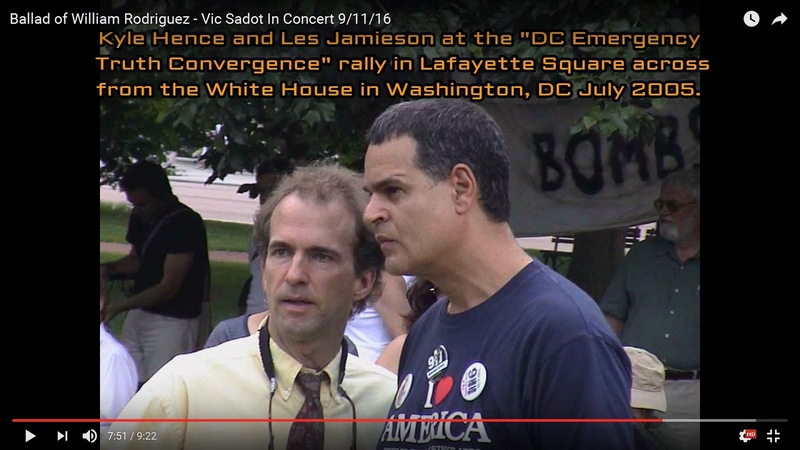 One suspect was able to escape prosecution by using his hidden wired mic to record his conversations with his FBI handlers who provided a live bomb instead of a fake one to entrap the other participants lined up by the FBI for the first psy op attempt. There is an early verse about how William Rodriguez survived that first bombing attempt. 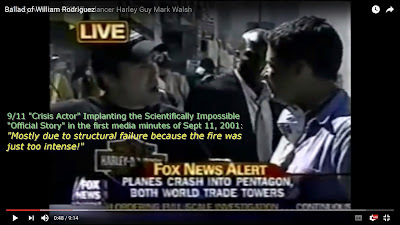 Early street scene in Ballad of William Rodriguez in which "Harley Guy" Mark Walsh, said to be a FOX News stringer performs a "crisis actor" role by implanting the scientifically impossible "Official Story" in the first media minutes of Sept 11, 2001. Mark Walsh flashes the OK sign as he claims to his Fox News friend that he “witnessed the entire thing from beginning to end” from where he lives 5 blocks away. “I saw this plane come out of nowhere and just ream right into the side of the Twin Tower, exploding through the other side. And then I witnessed both towers collapse, one first, and then the second, MOSTLY DUE TO STRUCTURAL FAILURE BECAUSE THE FIRE WAS JUST TOO INTENSE.” How many people stopped to think, during that tragic moment being broadcast live on every media outlet, that jet fuel is kerosene, and that in the more than 100 year history of steel frame buildings not one steel frame building had ever collapsed due to temperatures from the fuel in a mostly aluminum plane. Earlier exposed CIA mind control experiments revealed that the terminology for this implanting technique is called “trauma based conditioning”. 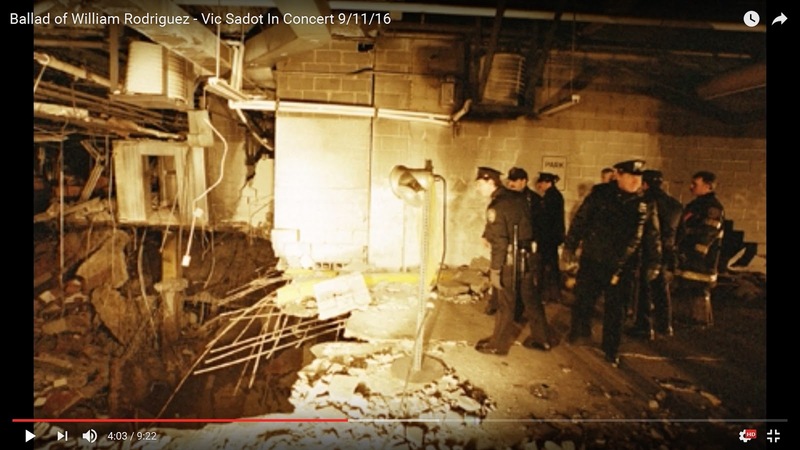 Two people who were lucky to not come to the World Trade Center at the start of the day were Lucky Larry Silverstein, the owner, and William Rodriguez, the head janitor, who was late and jumped right into the rescue efforts. He told me in our phone interview in July 2005 that he felt explosions at the lower level before he heard anything above, and within those first morning seconds Felipe David came into the Maintenance Office on sub-level 1 screaming with his skin burned and dripping from his face and hands. Willie was accused of being a con-man by several people, but my take is to be grateful that there are some people in this world who are not going to be bought or intimidated into participating in treasonous, murderous, duplicitous, criminal acts on their fellow workers and fellow human beings. The world needs more people who live that Golden Rule that's in the best of all religious and philosophical traditions. Now "Harley Guy", there is your classic media psy op "Crisis Actor". The photo of him in this article is linked to his testimony from that morning, if you want to see how it sells 15 years later after many scholarly detective studies as compared to how it sells 15 minutes after you hear that "America Is Under Attack by Muslim Terrorists" and "Both Towers at the World Trade Center have collapsed due to the intense fires of jet fuel from two passenger jets that reamed into them at upper levels. 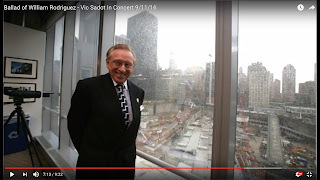 Lucky Larry Silverstein survived the demolition bombings of the World Trade Center by having his wife command him to go to the dermatologist instead of to his business meeting in the Windows on the World Trade Center North Tower. Luck Larry made millions in terror related insurance claims created only months before 9/11/01. He went on to rebuild the World Trade Center without having to deal with the hugely expensive asbestos contamination complications that riddled his old properties just recently acquired from the New York Port Authority through connections well detailed after 15 years of research, particularly by Christopher Bollyn in “Solving 9-11” and Kevin Ryan in “Another Nineteen Suspects”, which very oddly does not mention Silverstein among the 19 key suspects. I respect both authors and promote them and many others who may differ on some items. Respect is not a derivative of agreement, but has much more to do with the character and integrity one sees in a truth seeker and truth teller over time. And David Ray Griffin remains the Dean of them all! He's even published a new book on 9/11 for the 15th Anniversary. Vic's contacts and performance from the Washington July 2005 conference led to a singing invitation at 9/11 events in New York on the 4th anniversary with NYC 9/11 Truth where he got to know Les Jamieson and performed with his brother Rob Sadot at the UN demo and at St Mark's in the Bowery. He met William Rodriguez at that time and actually first sang The Ballad of William Rodriguez in public with Willie standing there at his side. We also met and heard Donna Marsh O'Connor address the crowd. 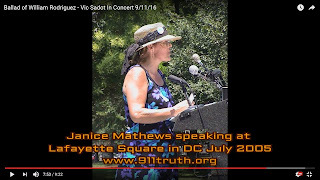 In this screenshot we see Donna Marsh O'Connor speaking at the 9-11-05 NYC demo atthe United Nations Dag Hammorskold Plaza holding a photo of her dead pregnant daughter Vanessa Lang Langden sobbing and screaming, “Where are the men in the suits today? Why are they not here? I want real answers to why my daughter was killed? And I’m not getting them!” She is a Syracuse Professor and a member of the anti-war group called "September 11 Families for Peaceful Tomorrows", who are apalled at how the deaths of their loved ones were used to conduct mass violence on other nations in no way responsible for what was done to their families. Donna Marsh Introduced Ray McGovern at the University of Binghampton in central New York State on Sept. 6, 2016 in a program called 9/11 Fifteen Years Later - What Have We Learned? Setting up an investigation of the 9/11 Crime scenes was delayed as long as possible and both Cheney and Bush met with Congressman Daschle, the Democratic Party Senate Majority leader to request that he limit the parameters of the Joint Congressional Inquiry led by Senator Bob Graham and Congressman Porter Goss.Their report was released in 2002 and a limited hangout strategy was emplaced by classifying "28 pages" that seemed to somehow tie someone in the Saudi government to the 9/11 plot. The 9/11 Commission Report did not release its report until 2004 and it did not mention WTC Building #7, which went down later in the afternoon on 9/11 at close to impossible free fall speed! Here we see Commission Chairs Thomas Keane on the left and Lee Hamilton on the right consulting with Executive Director Philip Zelikow on the Commission's proceedings. The Commissioners later wrote a book called "Unprecedented" to cover their butts by claiming "we were set up to fail". Philip Shenon of the New York Times wrote a book called "The Commission: The Uncensored History of the 9/11 Commission". One reviewer Evan Greer states four years later in 2008: "The black hat of Mr. Shenon’s story is the commission’s executive director, Philip Zelikow. Brilliant but abrasive and secretive, he is regarded by some commission staff members as a White House mole, compromised by his close ties to Condoleezza Rice, then President Bush’s national security adviser. The book’s portrait of Mr. Zelikow is harsh, but Mr. Shenon seems to have reached out to Mr. Zelikow to get both sides of the story. (Mr. Zelikow scoffs at charges of conflict and conspiracy made by Mr. Shenon’s sources.)" 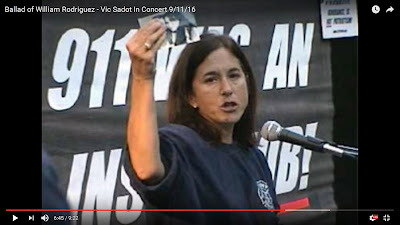 San Francisco activists were quick to react to the 9/11 Commisssion cover-up story, claiming that it was "full of holes" and dumping mock-up copies with holes it into the SF Bay. All of these photos are screenshots from Vic Sadot's 2016 concert version of "The Ballad of William Rodriguez". Other important screenshots from the new 9 minute 22 second version follow. Please share this Truth Troubadour Blog and the links to the video with people you want to wake up to the truth about 9/11, the crime scene deliberately not solved in order to use its effects to manipulate people to support unnecessary resource wars abroad and repressive laws and money grabs at home. The last thing to consider these days is how so much of the 9/11 Truth movement got derailed by the energy and effort that went into responding to the appeals from Senator Bob Graham of the long-discredited Joint Congressional Committee Report on 9/11, which was done by a staff that largely moved across town to serve under 9/11 suspect Philip Zelikow's 9/11 Commission to produce a sanctified set of lies that are now enshrined in a 9/11 Museum at Ground Zero in New York. 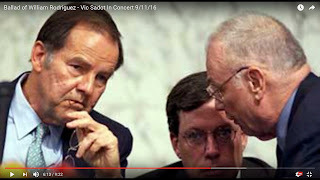 Zelikow should have been a suspect or should have suffered some consequences given that he had served as Undersecretary for National Security under Condoleeza Rice in the Bush-Cheney White House. He is a dual citizen of Israel and the USA and his academic expertise is maintaining public myths. What kind of 9/11 Truth movement devotes countless hours to trying to get "28 pages" from a long discredited Congressional Committee's 2002 report while ignoring the Bill of Rights Campaign to get the full 6,700 pages of the 2014 Senate Report on US Torture? Senator Diane Feinstein DE-CA only released a 500 page summary. Yet that information repudiates much of what is in the Congressional and Commission reports due to the fact that some people who provided "testimony" from torture sessions have since been absolved and released after spending years in Guantanamo under the most cruel and harsh conditions. The best article I've seen that brings that home is one written in Washington's Blog. Read “Torture Architect Tries to Justify Program … Fails Miserably” By Washington's Blog (also in Global Research, December 16, 2014). 25% of the footnotes in the 9/11 Commission Report come from torture testimony! Why did dual citizen Philip Zelikow, Assistant National Security Director to Condoleeza Rice get to be Executive Director of a Commission that should have been investigating his own failure to protect us? A Commission that should have been investigating him used torture testimony as its central source of documentation! Barrie Zwicker (please excuse screenshot spelling error seen) presenting at the DC Truth Emergency Convergence. 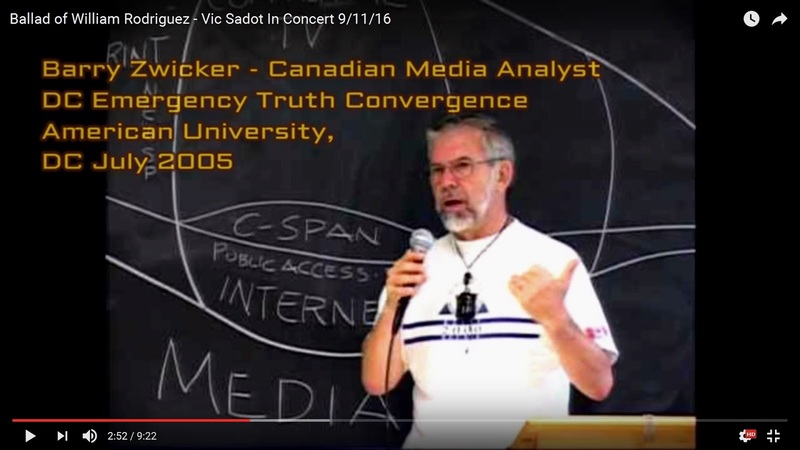 Zwicker was a major media analyst based in Toronto when his career was dead-ended by his committment to getting to the truth about 9/11. He had already produced two excellent documentary videos: "The Great Deception" in 2002 and "The Great Conspiracy" in 2004. His book "Towers of Deception: The Media Cover-up of 9/11" may be his masterpiece since it concentrates on the criminal complicity of the corporate media in covering-up the crimes and spreading unsubstantiated disinformation about what actually happened. Click on Rudy's photo and it should take you to his Facebook page. He also writes at Berkeley Calling Blog on WordPress and Broadside Balladeer Blog on Blogspot. Truth MovementIntegrity Activists Facebook Page: Posts to promote respect and integrity in the truth seeking community; against censorship; for fairness, honesty, respect, logic, and verifiability.